'Doctor Who' will return to BBC One Sunday, November 15 at 7pm on BBC One with 'The Waters of Mars'. 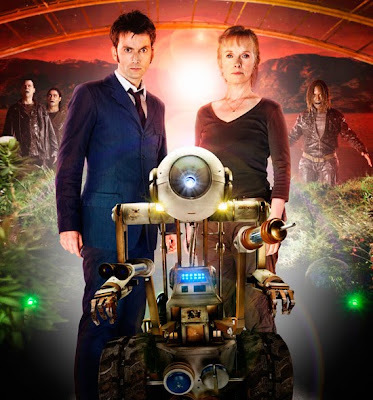 The Russell T. Davies and Phil Ford-penned episode and has been directed by Graeme Harper and produced by Nikki Wilson. The episode will be followed by two more specials, one being broadcast on Christmas Day with the conclusion and Tennant's final outing as The Doctor before his regeneration yet to be announced but expected to air late 2009/early 2010. 'David Tennant Interviewed On GMTV Promoting 'Waters Of Mars' & Discussing His Final Scenes and Possible 'Doctor Who' Movie. Steven Moffat revealed he is writing six of the episodes and overseeing another seven for the new series and promised fans "great stories" and said there would "joyous moments" as well as "heartbreak" while attending the 2009 Screenwriters' Festival in Cheltenham. The head screenwriter/ showrunner is currently working on the script for the series finale for which expectations will be high. "[My] biggest challenge right now is the writing of Episode 13," he confessed. He also praised Matt Smith. "He's all the things you'd expect, including ancient," and "someone you can't take your eyes off". Moffat also said he is under a lot of pressure to continue the series's success as the new show runner/ head writer. "What if I broke Doctor Who? That would be a tragedy," & "Yes, you do feel [the] pressure," he added. The new look Tardis was mentioned too. "There is a plot reason for it,""I always liked the Tardis from the Peter Cushing [Dr Who] movies, and wanted to make it more like that".